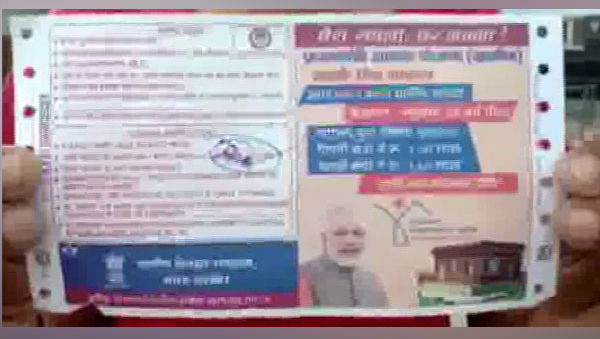 Barabanki (Uttar Pradesh), April 16: The Election Commission of India (ECI) has suspended two Railways employees after tickets with the photograph of Prime Minister Narendra Modi printed on them were issued to passengers at Barabanki railway station on Monday. One of the passengers, Mohammad Shaqbar, who lodged a complaint with the ECI told ANI: "I bought a ticket for my aunt from Barabanki to Varanasi. I was shocked to see the ticket with a picture of Prime Minister Modi. As it is a violation of the model code of conduct (MCC), I raised my voice and registered a complaint with the EC. "Sub Divisional Magistrate (SDM) Sandeep Gupta said: "On 13 April, when shift changes, the old roll featuring Prime Minister was mistakenly used. Train Tickets Still Bear PM Modi's Image Despite EC's Warning to Railways; Barabanki Passenger Shares Image. However, we were directed to use a new roll after the MCC came into effect. As boxes of both the rolls were same, the employees mistakenly took out the box which had an old roll." "Two employees have been suspended in the case and department probe is underway," he added. Lok Sabha elections in Uttar Pradesh are being held from April 11 and will go on till May 19 in all seven phases. Counting of votes will take place on May 23.